More than 30,000 people (many of them teenagers) commit suicide in the United States each year, while an estimated ten times as many attempt it, leaving family and friends at a loss for what to say or do. William Rauscher believes the time has come for all of us to look long and hard at an issue that, as A. Alverez wrote, "has permeated Western culture like a dye that cannot be washed out" - for the question of suicide affects people from all walks of life, and is more complicated today than ever before. To Be Or Not To Be is dedicated to the prevention of suicide and it speaks to those who contemplate taking their own lives, as well as to parents, teachers, doctors, clergy, counselors, and friends of individuals troubled by doubts about life's worth. William Rauscher provides a well-balanced look first at the arguments in favor of suicide, arguments bolstered in recent years by the right-to-death movements, and others who ask, "Is life always and under all conditions better than death?" He then goes on to refute these arguments, thoughtfully drawing on religion, psychology and most important, his extensive experience as a priest and counselor to individuals and families in moments of crisis. Numerous case studies throughout support Rauscher's position that finally, suicide is not the answer, despite the logical arguments than can be raised in its favor. Sensitive and mature, To Be Or Not To Be is a rational, readable guide that gives useful and inspiring counsel on one of the most disturbing problems facing us today. Numerous case studies throughout support Rauscher's position that finally, suicide is not the answer, despite the logical arguments than can be raised in its favor.Chapter titles include: Preface; The Case for Suicide? ; Suicide and Mystical-Psychic Experience; The Temptation of Death; The Ways and Means of Suicide; Guidance: Religion or Medicine? 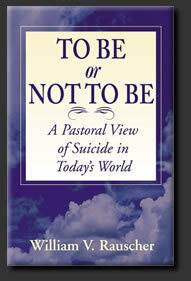 ; The Case Against Suicide; The Philosophers and Theologians; The Case Against Rational Suicide; What Does the Bible Say? ; Afterword; Notes and Bibliography. Rauscher is a retired Episcopal Priest. His ministry of nearly forty years provided him with a wealth of pastoral experience. In his last parish, Christ Church, Woodbury, New Jersey, he served as rector for 36 years. His many interests include ascetical and mystical theology, parapsychology, the study of consciousness and the many sense and nonsense pathways of religion. His insights into contemporary religion in today's society and practical approach provide an unusual and thought provoking exploration of the ever-controversial subject of suicide. He is an Honorary Canon of Trinity Cathedral, Trenton, New Jersey, and for many years has enjoyed stage magic as a hobby, while also known nationally and internationally as an historian and author of the subject. He lives in Woodbury, New Jersey. Available from Exlibris 1-888-795-4274 or Xlibris bookstore. Also Special Order Desk at bookstores. All Xlibris books are registered with the major online booksellers, including Amazon.com and Borders.com. Price: Hardback $25. Paperback $16. "It is a wonderful Christian evaluation with excellent references." "Provides a balanced account of the arguments in favor of suicide, then goes on to refute them, drawing on psychology, religion, and most importantly, his experience as a priest andcounselor to individuals and families in moments of crisis." "An ideal popular counseling tool." "Canon Rauscher tells both sides of the suicide issue through the views of philosophers and theologians from ancient to modern times." "Considering the alarming suicide rate in our times, this work appears as a most relevant and provoking dialogue. Admirably presented so that it's easily comprehended." Herb Vallow - The Courier-Express, DuBois, Pa.
" & a time of stress, it could save some lives from self-destruction."